Credit: Hubble Space Telescope. David Law; Dunlap Institute for Astronomy and Astrophysics. Like a beautiful rose sprouting from a field of weeds, a spectacular spiral galaxy has emerged near the edge of the observable universe, where most galaxies are ragged blobs. The newfound galaxy is the most distant spiral ever seen and may offer clues to the origin of spiral structure in galaxies elsewhere. Today about two thirds of all bright galaxies, including the Milky Way and Andromeda, are spirals. These galaxies have fast-spinning disks whose stars and gas clouds nevertheless move slowly relative to their neighbors, a condition that favors the formation of spiral patterns. In the distant past, however, spirals were rare, because stars and gas clouds moved fast relative to one another, suppressing spiral structure; so as astronomers peer out at great distances, they look back to a time before these glowing pinwheels existed. Astronomer David Law of the University of Toronto in Canada and his colleagues used the Hubble Space Telescope to examine 306 far-off galaxies. "There was this one that just popped out, looking like a spiral," says Law; the galaxy had three spiral arms. "We were pretty astounded when we first saw it. We thought, 'Oh, we must have the wrong distance.'" But, as Law's team reports online today in Nature, subsequent observations confirmed the galaxy's great distance. Residing in the constellation Pegasus and named Q2343-BX442, the surprise spiral has a redshift of 2.18, which means it is 10.7 billion light-years from Earth and therefore existed just 3 billion years after the big bang. With the Keck II telescope in Hawaii, the astronomers then detected Doppler shifts from different parts of the galaxy's disk, indicating it spins as fast as the Milky Way does. The galaxy is 50,000 light-years across--less than half the diameter of the Milky Way's stellar disk--but harbors more gas and spawns far more new stars. "It's surprising, and it's telling us something, but we haven't quite understood everything it's telling us," says astronomer Bruce Elmegreen of the IBM Research Division in Yorktown Heights, New York, who was not involved in the discovery. "It may be showing us a physical process that's really very important, like how spiral arms push material toward a galaxy's center." "It seems to me to be some kind of very interesting, possibly even a new manifestation of spirality," adds astronomer Joss Bland-Hawthorn of the University of Sydney in Australia, because the galaxy's stars and gas clouds move fast relative to their neighbors, yet despite the turbulence the galaxy has been able to form spiral arms. "I don't think we've ever found anything like that in the local universe." 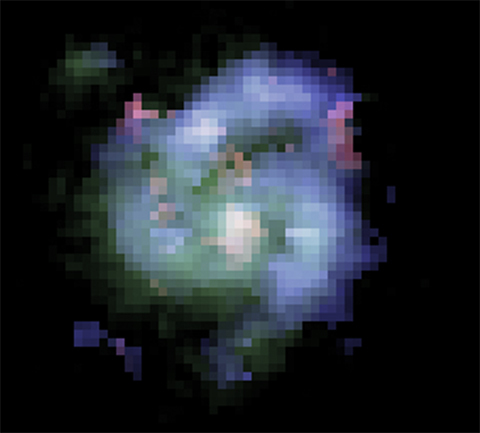 So how did this far-off galaxy create its spiral pattern? Law says the galaxy has a small companion whose gravity may have stirred up the spiral structure. In fact, the first celestial spiral ever seen--the Whirlpool Galaxy, whose spiral arms William Parsons in Ireland discerned in 1845--probably owes its beauty to the gravitational tug of a prominent satellite galaxy. However, Elmegreen questions this idea, noting that most spirals stirred up by companion galaxies have two arms, not three. Instead, he says the large amount of gas in the galaxy may be responsible. Although the stars and gas clouds in the galaxy move fast relative to their neighbors, Elmegreen says the gravity of all the gas may overwhelm the high velocity dispersion and mold a spiral pattern. Whatever the spiral's origin, the galaxy may no longer be so beautiful today. During the nearly 11 billion years that its light has traveled to Earth, the galaxy may have collided with another large galaxy that tore the spiral asunder, transforming it into a featureless elliptical galaxy--a fate that likely awaits the Milky Way after it smashes into the Andromeda Galaxy billions of years from now. Ken Croswell earned his Ph.D. for studying the Milky Way and is the author of Magnificent Universe and The Alchemy of the Heavens. "Elegant and eloquent." --Kathy Sawyer, Washington Post. See all reviews of Magnificent Universe here. "An engaging account of the continuing discovery of our Galaxy...wonderful." --Owen Gingerich, The New York Times Book Review. See all reviews of The Alchemy of the Heavens here.